An in-depth analysis of Liverpool’s goalscoring record under Jurgen Klopp and what it means for the 2016/17 season. Is it goals or is it clean sheets which win games, points and trophies? For Liverpool this season under Jurgen Klopp, it’s going to have to be the former, with the defence not quite yet up to scratch in terms of system, personnel or depth. But thankfully for Reds supporters, the other end of the pitch is looking increasingly healthy under the German boss. 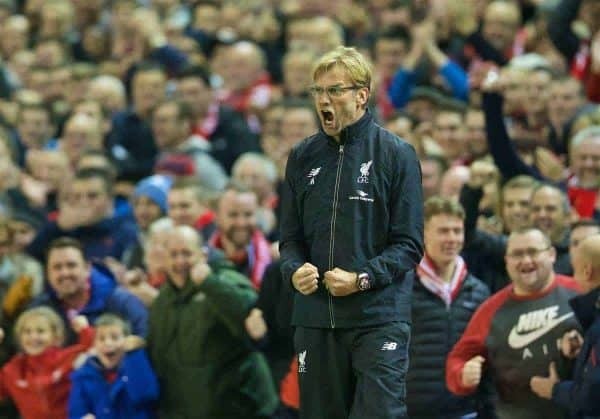 While any kind of regular attacking impetus had been lost under former boss Brendan Rodgers in his final year or so at the club, Klopp quickly got Liverpool on the front foot again and, with the exception of one drop-off, the team have been scoring regularly under the current manager. The Reds are of course nowhere near the finished article, and indeed due to Klopp’s style of play may never truly approach perfection with regularity, but analysing the goals scored in his time gives an indication of just how much he has improved that area already—and also gives an insight into why certain players have been signed or regularly played. Following the game against Tottenham at White Hart Lane, Klopp has now presided over 56 competitive fixtures in charge of Liverpool, during which time the Reds have notched 97 goals—an average of 1.73 goals per game. At the very basic level, that’s an improvement on how Liverpool were faring under Rodgers at the time of his departure; Rodgers’ last 56 yielded only 68 goals, or 1.21 per game. Indeed, the later the now-Celtic boss’ reign at Anfield went on, the worse the team got in terms of attacking effectiveness. In Rodgers’ last 69 matches—from the start of 2014/15 up until the point he was sacked—Liverpool managed an average of just 1.23 per match, 85 in total. Klopp’s friendlies aren’t included in those numbers; the Reds have 18 goals in nine non-competitive matches—2.0 per game on average—but scoring one against Tranmere and four against Barcelona, not finding the net against either Chelsea or Mainz and putting the same number past both Milan and Huddersfield speaks volumes: non-competitive games are meaningless and irrelevant from an analysis and comparison point of view. The raw data for hitting the net is only one part of it though, and effectiveness in front of goal can be measured in other ways such as consistency. There, too, Klopp has made improvements in the wait between when Liverpool fail to score in a match. Rodgers’ final season-and-a-half saw the team fail to notch every 4.1 matches on average, his final 56 games saw that improved slightly to every 4.3… and now Klopp’s 56 in charge see the average sitting at once every 4.6 matches—12 times out of his 56 so far. It seems marginal, but that’s effectively an additional 45 minutes of play before the Reds fail to score, which could mean the difference between a 0-0 draw and a late 1-0 win. So, goalscoring itself has gone up under Klopp, but also the spread of goals has gone up—scoring in more matches (regardless of number of goals scored) than under Rodgers. But is 1.23 to 1.73 a significant step up? Consider the Premier League goalscoring traits, from last season and previous campaigns. The table below shows the average goals per game scored by the teams finishing first to fourth each year, as well as Liverpool’s mean figure and position. Last season, 2015/16, can be viewed as a strange one for many reasons, but at least it was consistently strange; as well as Leicester City winning the league and reasonably big (or historic, at least) clubs being relegated, the goalscoring was down across the board (despite, lest we forget, plenty of onlookers decrying the standard of defending in England as being worse than ever. If that’s true, it doesn’t say much for the attacking, either). The Reds’ goalscoring exploits have been substandard for way too long; take out the Luis Suarez-boosted runner-up campaign of 13/14 and the average for the other four recent seasons is just 1.54, well below the target needed to be hit to be in the running for the top four. Although goals alone don’t guarantee a top four finish, they’re a vital target to hit. Only once in the last five years has a team managed to take fourth place with less than 1.7 goals per game (equal to just over 64 scored across the campaign). On the other hand, a team hitting the 1.8 goals per game mark (69 scored in the season) all but guarantees a top-four finish. In fact, only one team has failed to do so after reaching that target since 2010/11: Liverpool in 12/13. 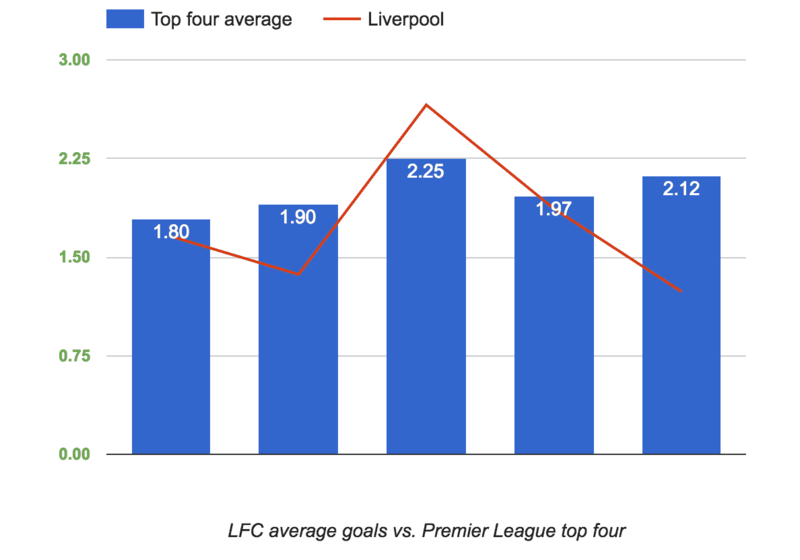 So Klopp’s current rate of 1.73 doesn’t look enough to justify Liverpool as a top-four team in goalscoring terms…but further evaluation shows that might not tell the whole story. The German boss took over midway through the last campaign, which brings with it all kinds of positive and negative connotations: it wasn’t his team, he perhaps didn’t know the players or the league, he benefitted from a “bounce effect,” the team quickly got behind him after a few positive results. It can be spun any way a reader (or pundit, rival or chief executive, for that matter) wants, but a methodical look at the patterns behind Klopp’s attacking output reveals more of a truth than a general overview. Logic—of the footballing kind, at least—suggests that the longer a manager has with his team, the more they will play to his style, his wishes, his image. That’s not necessarily a good thing, of course, depending on the manager in question, but with Klopp a proven winner and with a huge reputation, the expectation of him improving the team over time is very much there. So, split his games straight down the middle: the first 28, and the second 28. The first group of games yielded 42 goals, an average of 1.5 per game. In that period, his team failed to score on nine occasions, or once every 3.1 games. Goalscoring was immediately up on Rodgers’ last days (1.21 per game, remember) but still way off the pace for the top four. The second group of 28 matches? That would be 56 scored, at a rate of 2.0 goals per game on average. And, just three blanks, a failure to score just once every 9.3 games. Quite the improvement in the second half of Klopp’s tenure, it seems. Broken down even further, the patterns become clearer. Proof is worthless without points, but the undeniable upward trend is there: Liverpool are scoring a lot more goals under Jurgen Klopp as time goes on, and finding the net each match with more consistency too. The four games for this season are a little unreliable at present, of course, being such a small sample and having played every match away from home, but having started with plenty of goals in the team it’s a positive sign for the future. If Klopp keeps Liverpool anywhere around the 1.9 goals per game average, which the team has been above and over since February, the defence will have to be awful indeed—not entirely out of the question, of course—to keep the Reds away from exciting, sustained progression. Those numbers of Klopp’s are based on all competitions, of course, so 1.9 overall doesn’t have to directly translate to 1.9 in the Premier League (and thus a top-four finish), but if the scoring rate after the turn of the year is still around that range then Liverpool have to be doing particularly well in at least one competition. Given there’s no Europe this season, it won’t bode well for domestic defences. 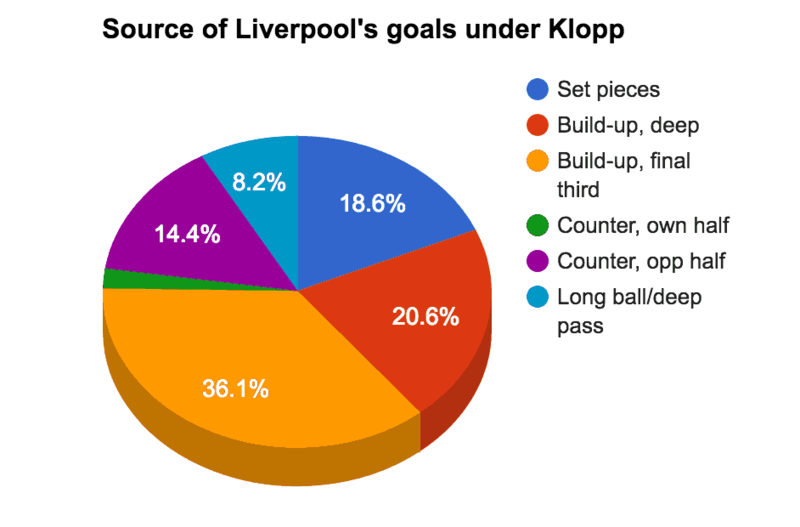 So Klopp has his team improving and scoring more goals—but what constitutes a Klopp type of goal? And how did that translate to the transfer market? While the above data was factual and inarguable, we now move into the somewhat more murky area of subjectivity, though not too much to affect overall conclusions. Firstly, all 97 [competitive] goals under Klopp were re-watched and grouped into one of six categories. It’s important to note that the type of goal scored is grouped according to the build-up, not the assist itself, as the idea is to gain a measure of how Liverpool attempt to (successfully) attack opponents. Controlled build-up play originating in the attacking third. The latter two categories are by far the most imortant and frequent methods of goalscoring for the Reds under Klopp, accounting for 57% of all goals scored so far. Despite the ongoing media obsession in some areas (and fan perception, to be entirely fair) with the gegenpress tactic and suggesting that Liverpool counter-attack teams whenever possible, from all areas of the pitch, counter-attacking (from both halves combined) has yielded just 16 goals in Klopp’s time in charge—that’s less than the total goals amassed from set pieces. Perhaps Klopp is just a German Tony Pulis after all. Let’s bring it back to the squad makeup, and the transfer window. Bafflement abounds every deadline day when Liverpool haven’t so much as sniffed at a pure defensive midfielder, but herein lies the truth: unless you shop at the absolute elite level, which the Reds do not, defensive midfielders can offer a breakdown in play as often as they help win back possession. Yes, the defence needs protecting and there will always be a need to have someone capable of destroying as opposed to creating, but in terms of regular first XI choices, Klopp first and foremost clearly wants his starters to be able to pass, link and open defences. That’s likely the reason for Emre Can being an all-in-one from deep who can surge and clip gorgeous passes just as often as he attempts to intercept and chases back, rather than—to use an oft-linked example—Ignacio Camacho being signed for £20 million who will display enormous aggression centrally, but whose passing is erratic. Georginio Wijnaldum comes under the same conclusion; he’s not the one most supporters expected to be added to midfield, but his power from deep is a tool in both directions and he links play well as well as arriving in the box late on in moves. 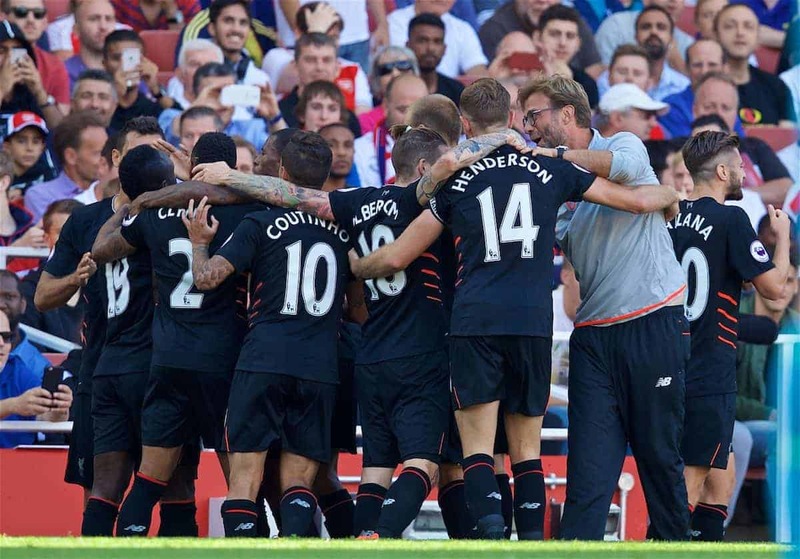 Build-up play, rotation of the ball and movement in the final third, is everything to Klopp and his high-tempo style. Which brings us to the next addition: Sadio Mane. Like Wijnaldum, not everybody was initially convinced by the outlay and the choice, but Mane has been the undisputed star of the Reds’ early season. Whether Mane can perform that way in 40 games instead of four is still to be determined, but even ignoring his starring role, his style is the important point to note. Under Klopp so far, 24 goals have come from either a pass, cut-back or low cross toward the six-yard zone from the channels, not outright aerial crosses but intelligently picked-out balls, usually after swift exchanges of passes to free a runner—a full-back or wide midfielder, often—behind the opposition defence. 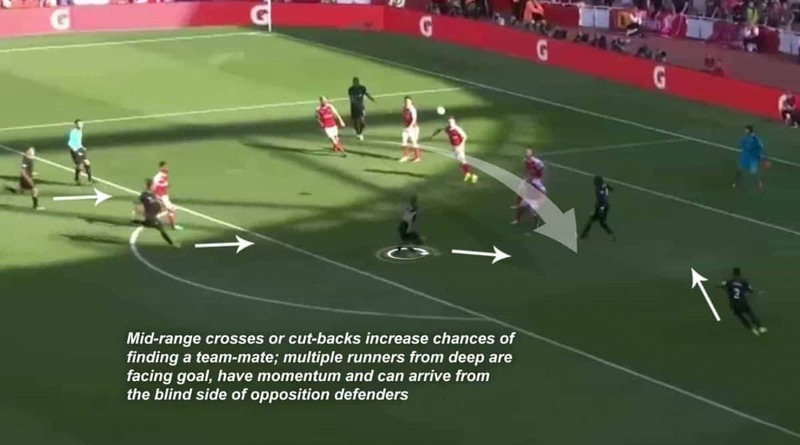 With two or three runners toward goal, the final passer has a choice of who to pick out and, given more bodies in the box at that point with forward momentum, even an initial save, block or ricochet can result in a second scoring chance falling the way of an attacker. 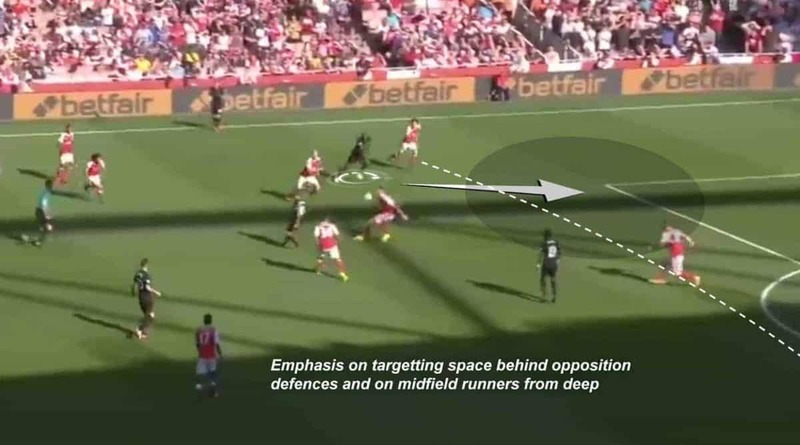 Mane’s pace and direct running, as well as his skill in one-vs.-one situations, plays directly to this approach and the switch to 4-3-3 this season is similarly focussed on getting multiple runners from deep in midfield into the penalty area. Lallana’s goal against Arsenal showcases the importance of those midfield runners, but another goal on that day showed Liverpool’s approach: Philippe Coutinho‘s second was down to excellent all-round build-up play culminating Clyne being played behind the defence and feeding in one of those dangerous, intelligent low balls into the six-yard zone. On the other half of the transfer decision-making front, it also indicates why Christian Benteke was offloaded: the importance of a run across the defender to the near post is what Liverpool have lacked far too often, and is a run the Belgian will never learn to make, let alone doing so naturally. The squad has goals, and the team has a system now which allows them to continuously attack and create chances. It won’t always go to plan—the Burnley defeat was an early reminder of that—but the approach of Klopp is undeniable, and perhaps most importantly, is undeniably working to improve the side’s performance.